How many times have you poured over student essays only to hand them back and watch as students take one look at the letter grade and never look back? Or maybe you offer a revision policy but never get the results you want? Reflection is one of the most powerful research-based strategies for use in the classroom. 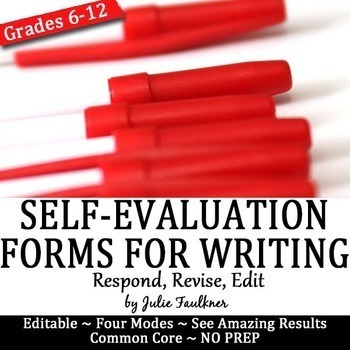 This is the perfect tool for students to use to actually go back and revisit and reflect on their writing after they have received feedback and a score. It doesn't do for them to just write and then "shove it in a drawer." Also, having students reflect in a structured way encourages them to study their feedback received as well - so all those long hours you've spent grading and commenting don't go overlooked and undervalued. 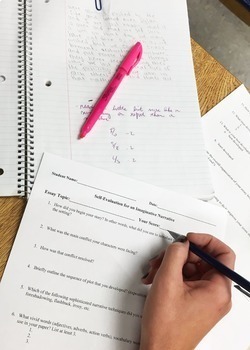 With these evaluation worksheets, students reflect on their writing in depth and learn to make true revisions to past writing while gaining critical skills for future assignments. This pack includes editable Word (.docx) format worksheets for argumentative, personal narrative, imaginative narrative, and explanatory. See more ready-to-go writing resources, too!